1. Mount Baker – Snoqualmie National Forest. The Mount Baker-Snoqualmie National Forest in Washington is an area of exceptional scenic beauty that extends 140 miles along the western slopes of the Cascade mountain Range from the Canada–US border to the northern boundary of Mount Rainier National Park, it also includes two large landmark volcanoes, Mount Baker and Glacier Peak which tower over the adjacent ridges. 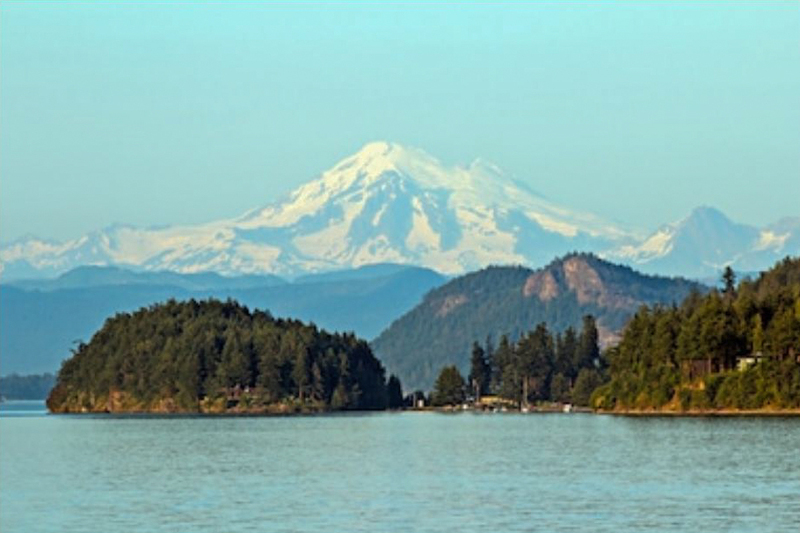 Mount Baker is the most significant landmark of the region as it is visible from all the waters and islands of Puget Sound and from the South Eastern part of the region. 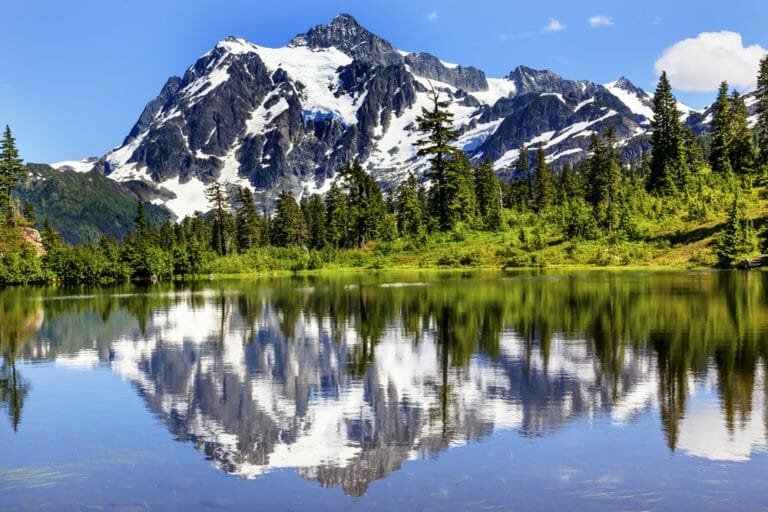 Mount Baker is a hikers paradise and includes attractions such as Nooksack Falls, Artist Point, Eleven Glaciers and the Mount Baker Ski area. If you wish to visit or stay and explore the area then you will find plenty of private, self-catering, fully equipped cabins, cottages, condos, chalets and Mount Baker Lodgings and vacation rental accommodation at the gateway to Mount Baker in places like Glacier Springs, Mt Baker Hwy, Mt Baker Rim, Silver Lake, Snowater or Snowline where you can enjoy all the local amenities or just put your feet up after a long day hiking, mountain biking, mountain climbing, backpacking, fishing, canoeing, hunting, exploring, nature trailing, downhill skiing, cross country skiing, snowboarding, snowshoeing, snowmobiling, sledding or enjoying some of the other attractions of staying in the state of Washington near Mount Baker. 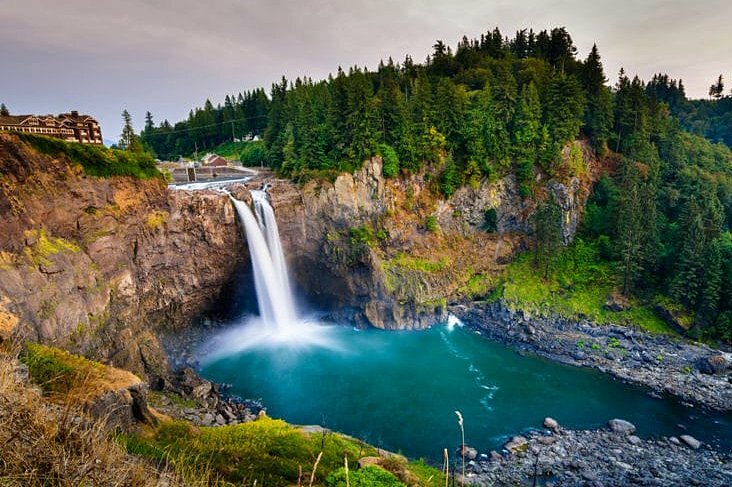 The Snoqualmie Falls is a 268 ft waterfall with a power station on the Snoqualmie River. It is one of Washington’s most scenic attractions and is famous for its appearance in the cult television series Twin Peaks. The mists rising from the base of the the Snoqualmie waterfall are said to connect Heaven and Earth and where prayers are carried up to the Creator by the great mists that rise from the base of the waterfall. 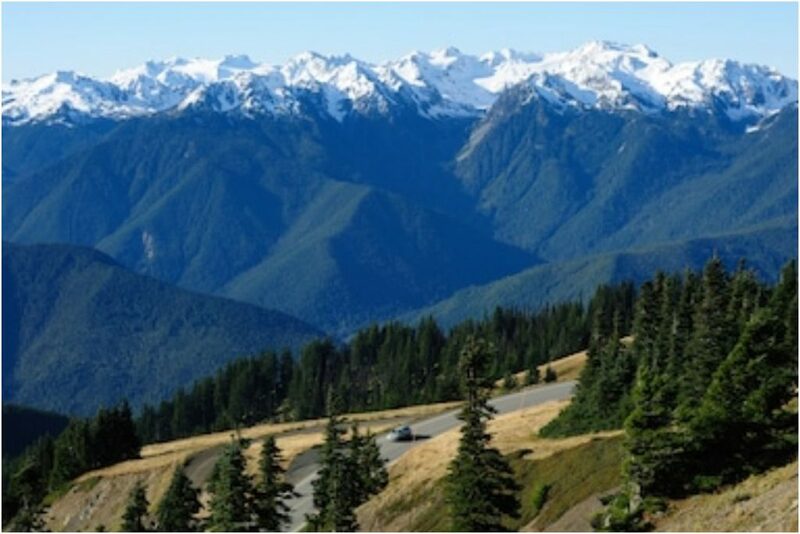 The Olympic National Park contains a vast and diverse wilderness with snow and glacier-capped mountains, scenic routes. old temperate rain forests and over 70 miles of coastline. 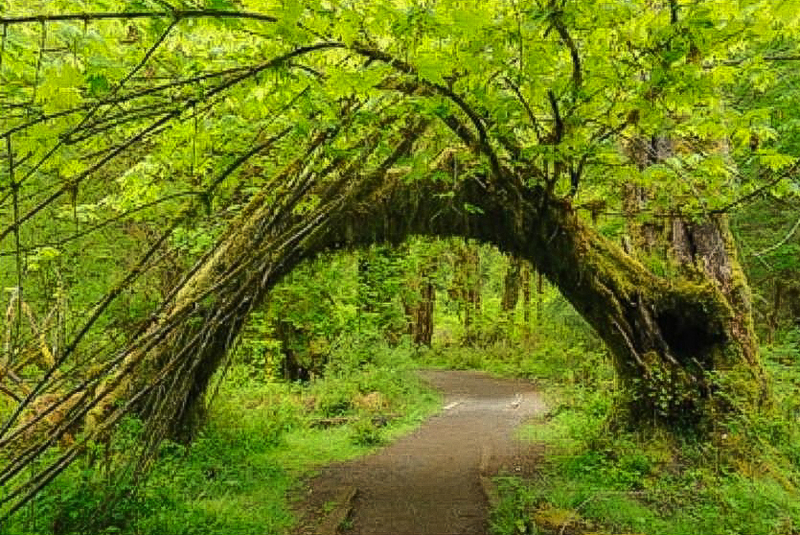 4.The Hoh rainforest is one of the finest examples of temperate rainforests in the United States and is one of the park’s most popular destinations. The high levels of rain in the forest during winter adds to the lush green covering of trees, mosses and ferns along trails and adds another dimension to the enchantment of the rainforest. You can also explore over 70 miles of wild coastlin or take a boat trip around the islands..
San Juan Islands is an archipelago in the northwest of Washington State. It offers whale watching with dedicated orca-whale lookouts or boat trips, it also offers kayaking, biking, hiking, dining experiences and cozy lodgings.There are four main islands San Juan Island, Lopez Island, Shaw Island and Orcas Island that is home to Moran State Park’s old-growth forest and Mt. Constitution. 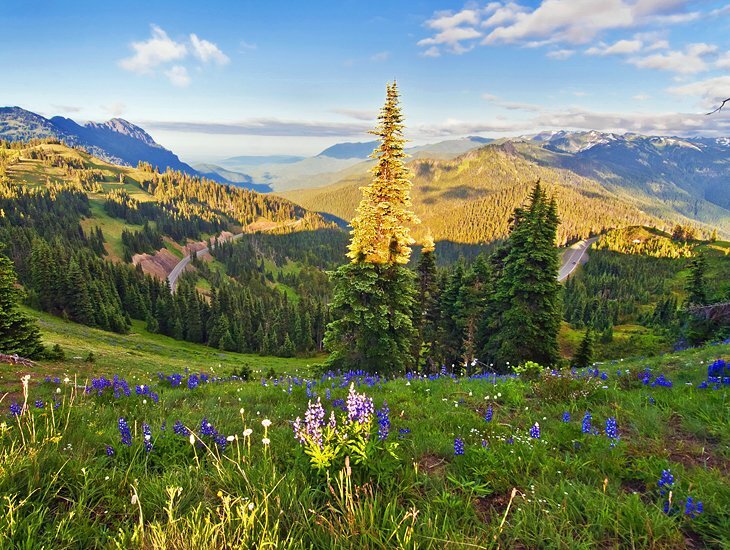 One of the most popular or visited national parks in Washington. Ascending to 14,410 feet above sea level Mount Rainier is the most prominent peak in the Cascade Range. It’s also one of the oldest national parks. 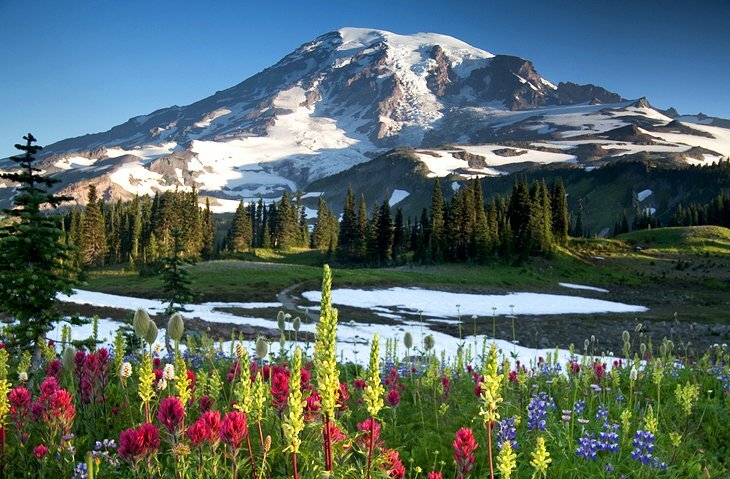 Wildflower meadows ring the icy glacier covered volcano while ancient foresst cloaks Mount Rainier’s lower slopes. When Mount St. Helens erupted in 1980, it reduced the peak by 1,300 feet and leveled much of the surrounding area. A cloud of ash rose 13 miles into the air, almost 150 square miles of forest were destroyed, causing fatal destruction to local communities. The Mount St. Helens National Volcanic Monument has since been set aside for both research and recreational purposes. Climbing and hiking opportunities are available, and it is even possible to climb Mount St. Helens, though permits are required. Visitor centers along Spirit Lake Highway provide insight into the disaster. Seattle is the largest city in Washington, and is known for its thriving tech industry, vibrant music scene and famed coffee houses. 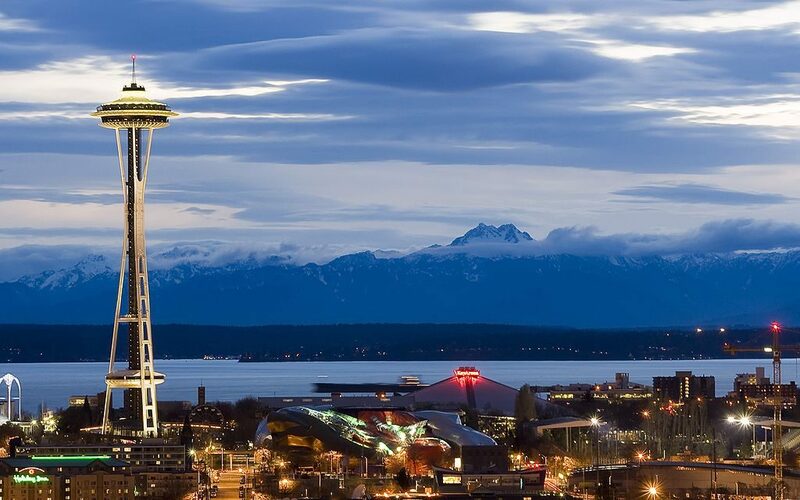 Its landmarks include the futuristic Space Needle, century-old Pike Place Market and Seattle Aquarium. Innovative glass art is displayed at Chihuly Garden & Glass. Pike Place Market is the standard draw for tourists, but the historic buildings and venerable institutions add diversity. Visitors will likely wish to catch an underground tour near Pioneer Square, or a performance at Benaroya Hall. And back on the waterfront, a sea-level exploration takes you from the Olympic Sculpture Park in the north to the Seattle Aquarium and ferry terminal further south. 8. Museum of Pop Culture, or MoPOP (Formerly known as the EMP Museum or Experience Music Project ) is a museum dedicated to contemporary pop culture. It was founded by Microsoft co-founder Paul Allen in 2000. Famous musicians from Seattle include Jimi Hendrix, Kurt Cobain, and Pearl Jam. MoPOP now spans music, science fiction, fantasy, horror, fashion, sports, and video games, MoPOP reflects our vision for curating, exploring and supporting the creative works that shape and inspire our lives. 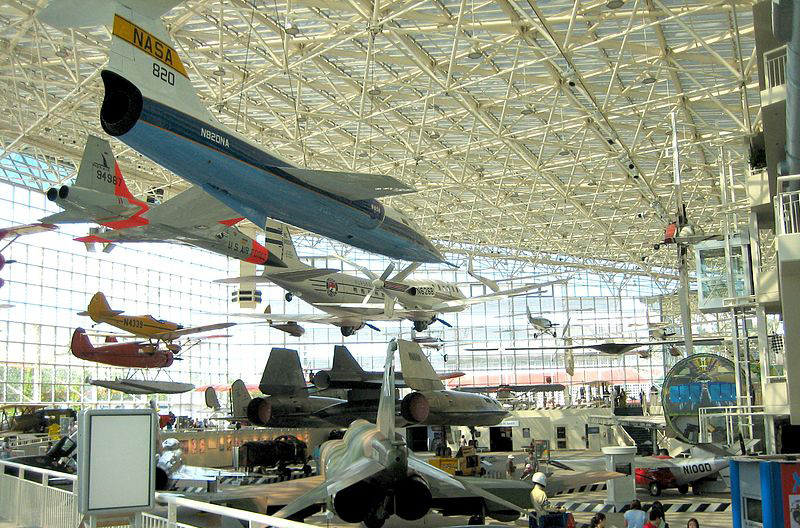 The Museum of Flight is one of Seattles premier attractions with over 160 air and spacecraft on display along with the original Boeing Aircraft factory flight simulators and dozens of fun, interactive exhibits and family activities. From the world’s oldest fighter plane to the supersonic Concorde, the only full-scale NASA Space Shuttle Trainer and the Boeing 787 Dreamliner, you’ll see the flying machines and experience the stories of those who flew them. The unique, 3-acre Aviation Pavillion shows the dramatic development of aircrafts in an open-air gallery with a cafe and children’s play area.A patio area and spectacular views of Mt. Rainer.- 9404 E. Marginal Way South,Seattle, WA 98108. 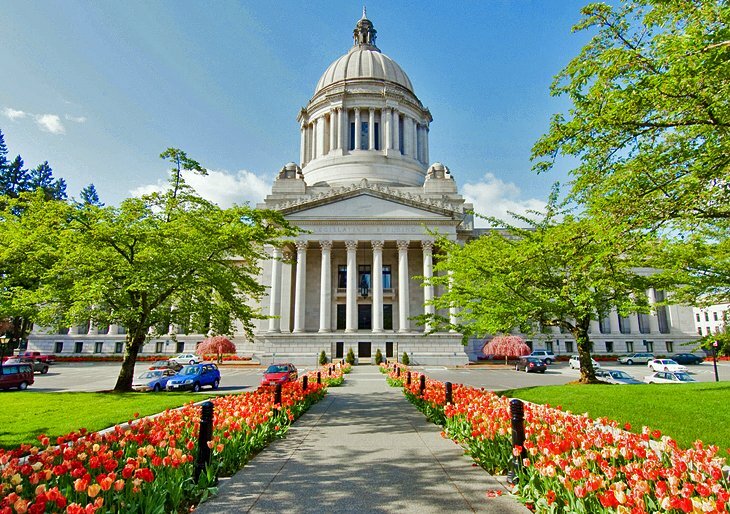 At the south end of Puget Sound, The State Capitol building in Olympia with its grand white dome rising 287 feet above the tree-lined street. The bulding was opened in 1928 at a cost of around seven million dollars. Free, guided public tours give the highlights of the building, including the five-ton Tiffany chandelier and permanent sculptures. Tacoma is the 3rd largest city in Washington and sits on the banks of Puget Sound, south of Seattle. 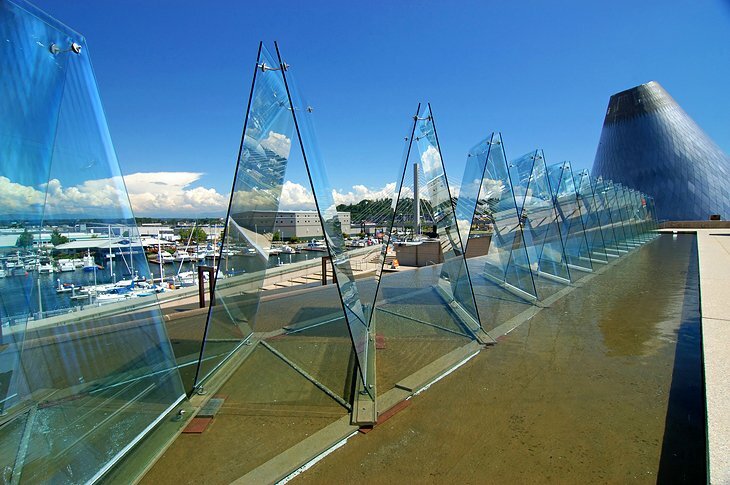 It’s known for its many museums including the Museum of Glass that includes works by Dale Chihuly who was born nearby and the Chihuly Bridge of Glass decorated with glass sculptures. The Washington State History Museum, a vast model railroad, The Tacoma Art Museum, Defiance Zoo and Aquarium, the Tacoma Dome and if you like cars there is the LeMay – America’s Car Museum. The town of Port Angeles lies along the northern shores of the Olympic Peninsula, across the Strait of Juan de Fuca. The region is known for the huge number of things to do outdoors, such as hiking, biking, golfing, boating, kayaking, fishing, birding, and more. It’s also an access point to Olympic National Park via the road to Hurricane Ridge. At this high alpine recreation area, hiking trails fan out from the visitor center leading to wildflower meadows in spring. Back at sea level in Port Angeles, the Port Angeles Fine Arts Center features changing Northwest exhibits in the semi-circular hilltop gallery. On the extensive grounds, visitors will find a museum without walls featuring more than 100 sculptures along rustic trails. The local Clallam County Museum introduces the area through historical exhibits. Port Angeles is also where ferries depart for Victoria, Canada. 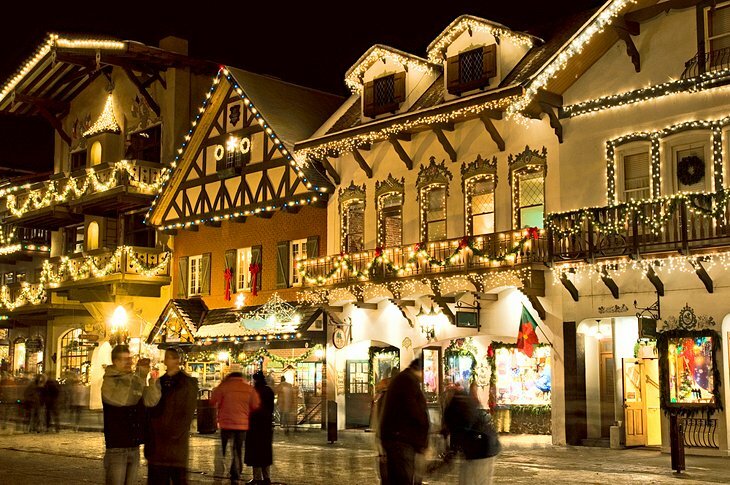 The town of Leavenworth proudly calls itself the Bavarian Village, celebrating its heritage throughout the year. It’s common to see local residents wearing lederhosen or blowing a morning serenade on an alphorn. The entire town is decorated in an adapted German architectural style, down to the Gothic scripts on the signposts. There are a number of annual festivals, including a holiday lights celebration in December. Ski hills, hiking trails, and rivers in the surrounding area also provide outdoor recreation. To the east, the Wenatchee Valley is famed for its apples and hosts the annual Washington State Apple Blossom Festival. The Coulee Corridor National Scenic Byway lies in the desert region of Washington State. It’s main feature is the Grand Coulee Dam, the “largest hydropower generating facility” in the USA and provides 75% of the Pacific Northwest’s power. The area has stunning scenery, with opportunities to explore areas like the Columbia National Wildlife Refuge. 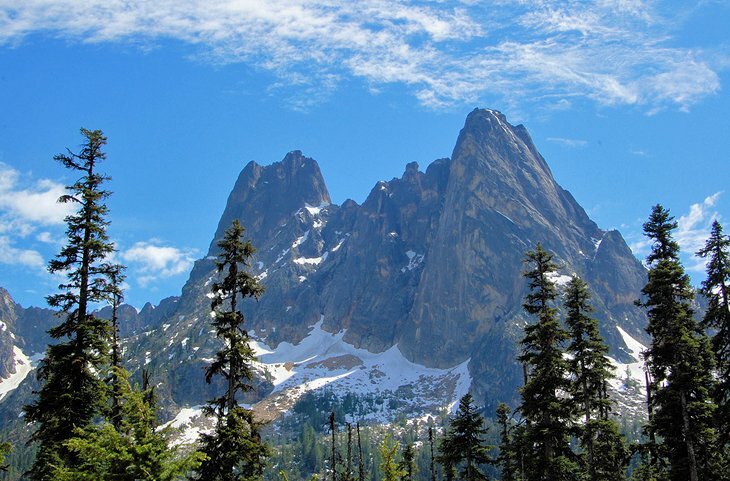 The North Cascades are one of the most unspoiled tracts of country in the USA. Anglers, hikers, and nature lovers are all well catered for in the national park, A drive through the park is rewarded with fantastic views. Anyone wanting to experience highlights like Ross Lake at close quarters, however, be prepared to don their walking boots. Mount Shuksan is one of the most picturesque mountains in the North Cascades National Park, near Mount Baker and the Mount Baker Ski Area. The highway bisects North Cascades National Park and provides one of the most scenic routes in the country . The tree-lined drive starts out near Marblemount and winds up through the old town of Newhalem, passes gushing waterfalls like Gorge Creek Falls, and threads past dams and the reservoirs of Diablo Lake and Ross Lake. The route allows visitors to admire the natural beauty as well as man made attractions like the immense, electricity-producing dams. Tourists can stop at Washington Pass to photograph the jagged peaks of Liberty Bell Mountain and Early Winter Spires, among others. Note that some routes through the mountain are closed in winter months but the road to the Mount Baker Ski Resort is kept open for longer. At the southern tip of North Cascades National Park, Lake Chelan National Recreation Area is home to one of the deepest lakes in the United States. One of Washington’s largest state parks, Mount Spokane has miles of trails for hikers, bikers and equestrians to enjoy views of Kit Carson, Day Mountain, Mount Spokane or views across the Spokane Valley, the Idaho panhandle or Canada. Look out for giant moose ambling across the trail. East of the Cascade Mountains, much of Washington State is less populated farmland. The weather is sunnier on this side of the mountains, but the tourist draws are also fewer and farther between. Spokane lies on the border with Idaho, and this major Washington city is a hub of attractions (parks especially) and amenities. 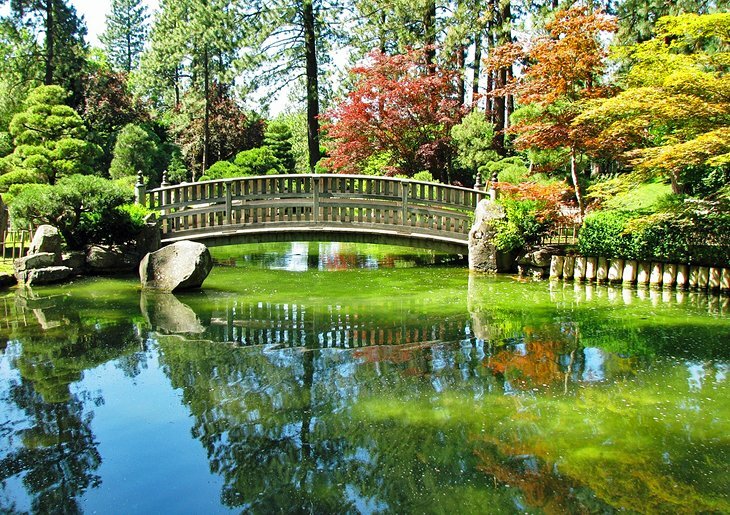 A variety of gardens, including the Nishinomiya Japanese Garden, attract visitors to Spokane’s Manito Park. The flowerbeds are particularly vibrant during summer. Spokane’s venue for the 1974 World’s Fair, Riverfront Park, now boasts a Ferris wheel, a hand-carved carousel made in 1909, and other amusement rides. And for the adventurous, there is skiing on Mount Spokane. 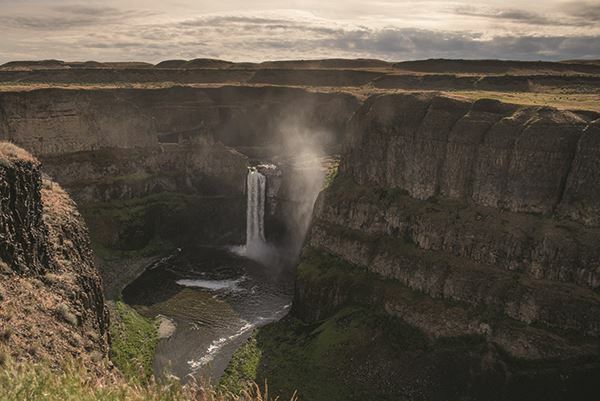 All visitors to the region should try and see Palouse Falls State waterfall. The Palouse River runs through a narrow cataract and drops 200 feet into a churning bowl and joins a swiftly moving current winding through gorges of basalt, to its southern end at the mighty Snake River. Located on the North Cascades Scenic Byway in Washington’s magnificent Methow Valley, Winthrop is a an old wild west town with wood boardwalks and western charm. Winthrop is home to the oldest legal saloon in Washington state. If you are l;ooking for a weekend away then you can stay in a romantic cabin, a charming cottage or an elegant resort. Whatcom Falls Park is a 241-acre park in Bellingham, Washington, United States. The falls are on Whatcom Creek, which leads from Lake Whatcom to Bellingham Bay. The park has four sets of waterfalls and several miles of well maintained walking trails. It’s a departure point for Mount Baker, but the university city of Bellingham is also a draw in its own right. For a quick introduction to this corner of the Pacific Northwest, stroll through Fairhaven Historic District and duck into local art galleries or catch some sun on a restaurant patio. Out of downtown, Western Washington University has amassed an excellent Outdoor Sculpture Collection, its campus dotted with works small and large. Another outdoor attraction is Whatcom Falls Park, with its four sets of falls and numerous walking trails. 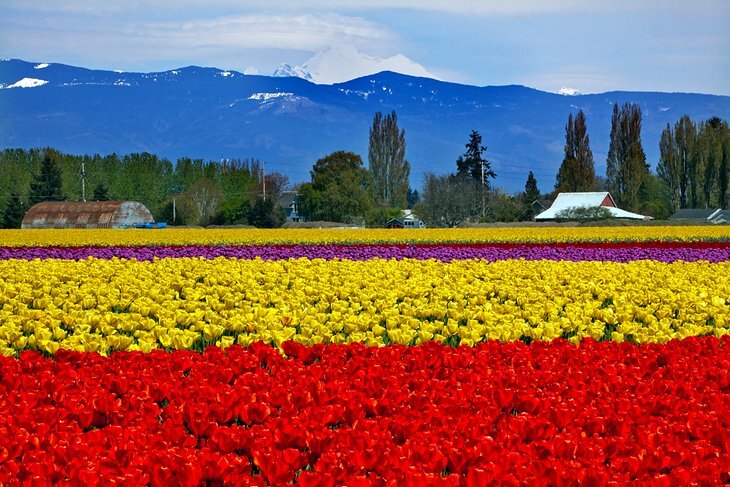 In the surrounding area, visitors can take scenic drives through the mass fields of Skagit Valley tulips in spring, or follow the twisting, narrow route of Chuckanut Drive year-round. From the Cascade Mountains westward, Western Washington has a mostly marine west coast climate, with mild temperatures and wet winters, autumns and springs, and relatively dry summers. The Cascade Range has several volcanoes, which reach altitudes significantly higher than the rest of the mountains. From north to south, these major volcanoes are Mount Baker, Glacier Peak, Mount Rainier, Mount St. Helens, and Mount Adams. All are active volcanoes. Mount Rainier, the tallest mountain in the state, is 50 miles south of the city of Seattle, from which it is prominently visible. If you are looking for Vacation Rental Accommodation in Washington a Mount Baker vacation rental cabin makes the ideal base to explore Washington and all the attractions that the region has to offer.